The kitchen is the heart of the home and a space where you can make the ultimate design statements. Filling pots and buckets of water will never be a hassle again. Easily pull out the retractable hose and fill away. Thoroughly rinse fruit and veggies. Similar to a hand shower, some pull-out sink mixers come with a dual spray function, allowing you to convert between a shower spray option and standard flow. Cleaning will also become much easier with a retractable sink mixer – not only washing and rinsing dishes, serving platters and larger items, but also the kitchen sink itself. There’s no need to push water around with your hand to remove dirt and waste! This can be done with the use of the extendable hose attached to the mixer tap. Dorf offers a range of beautiful pull out mixer designs for the kitchen. If you are after a sleek sophisticated look, opt for a black, white or chrome retractable mixer, such as the Dorf Vixen, or if you are after a tall pull down sink mixer, the Dorf Jovian would be a perfect fit. 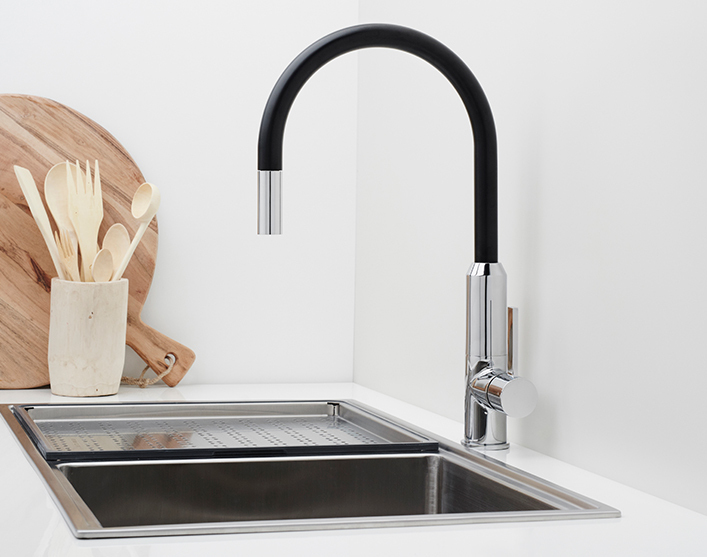 Kitchen tapware can be stylish and functional, view our latest range of mixers to find your perfect style match.